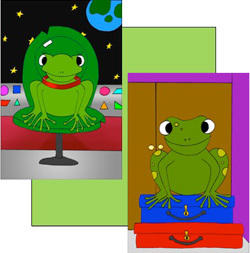 In Exploring Shapes in Space: Geometry with the Frogonauts, students help to prepare Farley Frog for his trip to the Lily Pad Space Station where he will join Freeda, a Frogonaut in space. Throughout the unit students are involved in investigations, Space Labs, and choice centers as they explore shapes and develop the geometry concepts involved in identifying and describing 2- and 3-dimensional shapes, composing and decomposing shapes, spatial orientation, and visualization. Chapter 1 explores composing and decomposing 3-dimensional shapes as students build 3-dimensional figures with blocks, using 2-dimensional models as pictures. The chapter involves students in describing the blocks (spheres, cubes, and rectangular prisms), identifying the number and shape of the faces, comparing the blocks to items in their own environment, and identifying blocks based on attributes. Chapter 2 focuses on location and navigation in space. Students help Farley learn to navigate the Lily Pad Space Station with positional and directional terms by describing a model of a Space Station they created and give directions to a partner to navigate through Lily Pad Pond. Students begin to distinguish between the more complex positional vocabulary of “left” and “right” and focus on counting spaces as a logical connection to number concepts. Chapter 3 investigates spatial orientation and visualization by identifying, describing, and manipulating 2-dimensional shapes. Through the chapter’s investigation and Space Lab students develop spatial memory and orientation skills that will lead to the discovery that flipping or turning a shape does not alter the composition of the shape. Throughout the unit, students are helping Farley understand geometry concepts through engaging game-like activities. We suggest that these activities be sent home with students to share and play with their families. This allows families to learn about what their child is studying and also provides students the opportunity to “teach” their families about important geometric concepts, thus strengthening their understanding of those concepts. 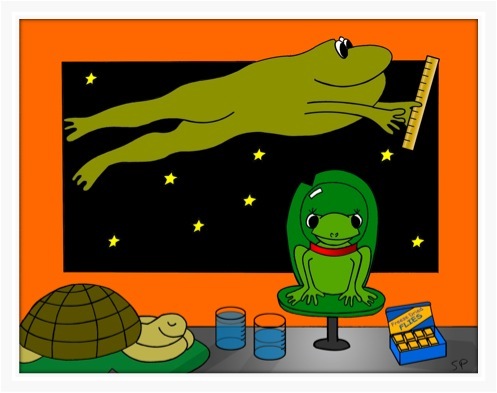 In Sizing up the Lily Pad Space Station: Measuring with the Frogonauts, students are helping to prepare Fonzi Frog for his trip to the Lily Pad Space Station where he will join Freeda, a Frogonaut in space. Throughout the unit students investigate the mathematical concepts and processes involved in measurement through Space Labs and choice centers. Chapter 1 explores the attribute of length. Students launch “space shuttles” to measure and compare the distances that the shuttles travel through direct comparison. Using their developing understandings of transitivity, students then order three or more of the distances from shortest to longest. Throughout the chapter students develop an understanding of accumulation of units, a need for equal-length units, and measuring with no gaps or overlapping units. Chapter 2 continues the study of length and then extends students’ measurement experiences by introducing area. This is an initial introduction to the measurement of area as a measure of covering. The concepts of equal-sized units and the inverse relationship between size and the number of units needed to measure are further explored in this chapterChapter 2 continues the study of length and then extends students’ measurement experiences by introducing area. This is an initial introduction to the measurement of area as a measure of covering. The concepts of equal-sized units and the inverse relationship between size and the number of units needed to measure are further explored in this chapter. Chapter 3 involves the exploration of volume and capacity. The use of cubic units is introduced in measuring the volume of a box, and capacity, is investigated through comparing the capacities of two containers. Students continue to develop the measurement concepts of comparison, using equal-sized units to measure, and the inverse relationship between size and the number of units needed to measure. Throughout the unit, students are helping Fonzie understand the process of measurement and measurement concepts through activities that help the frogonauts prepare to go up in space. The center activities can be sent home to play as games with families.